CRS has an incredibly deep rooted history in coolant recycling. There are many coolants used in all types of industries, ranging from automotive manufacturing to all types of metal processing. Coolants can be petroleum, water or chemical based fluids, with a variety of additives to protect the coolant, as well as the material they are in contact with. They also come in a variety of viscosities that are selected based on the application. Typically, oil based coolants are used in applications requiring more lubrication than cooling, and therefore are frequently used in applications like cold rolling metals or heavy duty metal cutting. Water based coolants are typically used in hot metal rolling processing, glass grinding, polishing or metal cutting/grinding operations where the work creates a lot of heat, therefore cooling is the preferred property. Chemical based coolants (glycols, PAO’s) are selected where special issues exist such as fire concerns, oxidation, exposure or the environment. All coolants have similar issues as they are used. This includes the build of fines, other debris, fluid breakdown and loss of additives, just to mention a few. Replacing the fluid to control these issues can be very expensive, therefore recycling is important to controlling costs and well as maintaining the quality of the product being produced. CRS has been involved in recycling these coolants for over 30 years. We have a variety of processes and equipment in our CRS Solutions tool box to recycle coolants and the selection of the right tools is a function of coolant condition. Typically filtration is one the primary tools used to help control coolant quality. The type of filtration depends on the fluid type and the used coolant profile. For example, water based coolants require special care as they can be sheared if the filtration media is too tight. There is a balance between contamination control and emulsion stability. On the other hand, oil based coolants usually contain very high levels of ultra-fines because of the work they do, therefore the filtration must be tighter to remove the debris load, yet not too tight, restricting cooling flow. CRS offers its proprietary TUF cross flow technology for filtration that can solve a myriad of coolant recycling issues. The TUF technology comes with a variety of membrane sizes and micron ratings that are selected for each coolant application. In most applications a second CRS Solutions tool is required to complement the TUF, such as distillation or a centrifuge to process the TUF concentrate. CRS has been solving coolant recycling problems for years with a creative assembly of tools customized by our engineers for our customer’s needs. 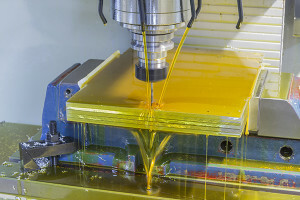 Hydraulic fluids and lubricants are used for many applications throughout industry, from hydraulic presses used in molding plastic parts, to motor oil used in car engines. During use, these fluids can become contaminated with metals, water and other fluids, as well as materials that can create ash. These contaminants can render the fluids unusable and often times require the fluids to be disposed of or highly diluted for further use. CRS has worked with our customers to develop specialized engineered solutions to remove these contaminants and supply a fluid that is very near original specifications. Depending on the requirements and level of contamination, CRS has many offerings for reprocessing. The CRS TUF technology has been successfully used to remove metals, down to sub-micron in size, as well as water and ash creating materials from numerous hydraulic fluids and lubricants. 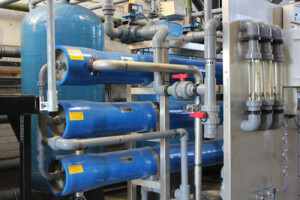 If water levels are higher than what our filtration technology can remove, CRS can custom design dehydration systems. When fluids have been contaminated with other lubricants or fluids, CRS can provide distillation technologies to remove the unwanted material, without the need for extreme heat to minimize thermal degradation. Polyethylene glycol and di-ethylene glycol (PEG and DEG) are used as carrier fluids for many cutting and grinding operations. Often, they are used along with silicon carbide powder to create an abrasive slurry. After use, PEG and DEG are contaminated with suspended solids, water and metals. There are several challenges associated with recycling these glycols. The small size and high concentration of suspended solids make filtration difficult. The high boiling point and temperature sensitivity make distillation a challenge. The hydroscopic nature of PEG can negatively affect downstream products and equipment. High metal contamination can also lead to downstream problems. CRS has developed several technologies that address these issues. 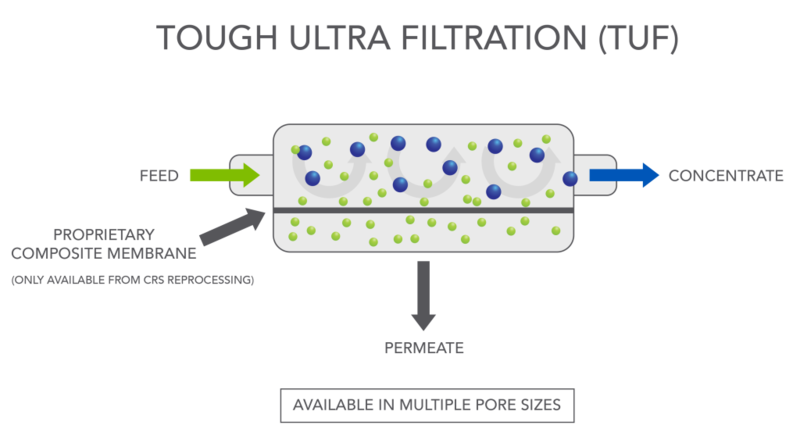 Our TUF filtration system successfully removes sub-micron sized particles. Its proprietary design and metallurgy out-perform other polymeric based cross flow filtration systems. If distillation is required, CRS custom designed vacuum distillation and thin-film distillation systems can effectively recover PEG and DEG. Our efficient design minimizes heat contact, helping maintain the properties of the recovered PEG and DEG. PEG and DEG dehydration is similar to distillation. CRS has designed and operated dehydrators that effectively remove water from PEG and DEG. These systems are capable of water removal efficiencies greater than 99%. Metal contamination can be controlled using nano-filtration or distillation. Many industrial processes use a solvent to clean the finished metal piece, to remove fine metal debris or to assist with the surface finishing process. As this solvent is used, it can become contaminated by degreasing, water or tramp oils. If the solvent is not reprocessed in some form it must be disposed of as a hazardous waste. CRS has specialized technologies that can reprocess spent solvents, returning the solvent back to its original specifications. This reduces both the volume of fresh solvent that is needed and the costs associated with disposal. CRS is an expert in the distillation of mineral oil coolants, seal oils and solvents. Depending on the application, filtration using our proprietary TUF technology is another option. All distillation and filtration systems are custom designed for each application. Using an on-site solvent reprocessing method reduces the amount of solvent waste byproducts, eliminates the cost associated with transporting the waste byproduct, lowers your liability and reduces your environmental footprint. Waste water from industrial production is generally contaminated with various substances. This requires effective waste water treatment to reach the required industry specifications. At the same time the facilities should function with energy efficiency and be sparing of resources. For processing, specialized knowledge is thus necessary: CRS has more than 30 years’ experience in the area of industrial treatment of fluids in various industries and is active internationally in Waste Water Treatment. For effective waste water treatment we analyze your samples in comparison with the specification requirements. This allows us to effectively consult with our customers, then plan and construct the facilities – and operate them cost-efficiently. Depending on the specifications, we use our physico-chemical or membrane technical procedures or combinations thereof to attain the desired purification levels. Our extensive range of services extends over the complete life of the waste water treatment facilities. We maintain the facilities, deliver the water chemicals and original replacement parts, optimize the processes and ensure smooth operation. Industry uses water for the most diverse purposes. It must, for example, be processed so that it is available in the quality specifications for production. And after use, the process water generally has to be treated again, either to be able to be legally introduced into a sewer or river, cleaned or placed into the water cycle. CRS develops, builds and installs effective process water treatment facilities which are custom designed and function in a cost-saving and environmentally friendly manner. As your partner we guarantee the supply of reprocessed water treatment, optimizing existing facilities and on request, assume the complete operation of your facility for the treatment of process water. We use the most modern technology with physico-chemical or membrane-technology procedures which produce required specified water quality. 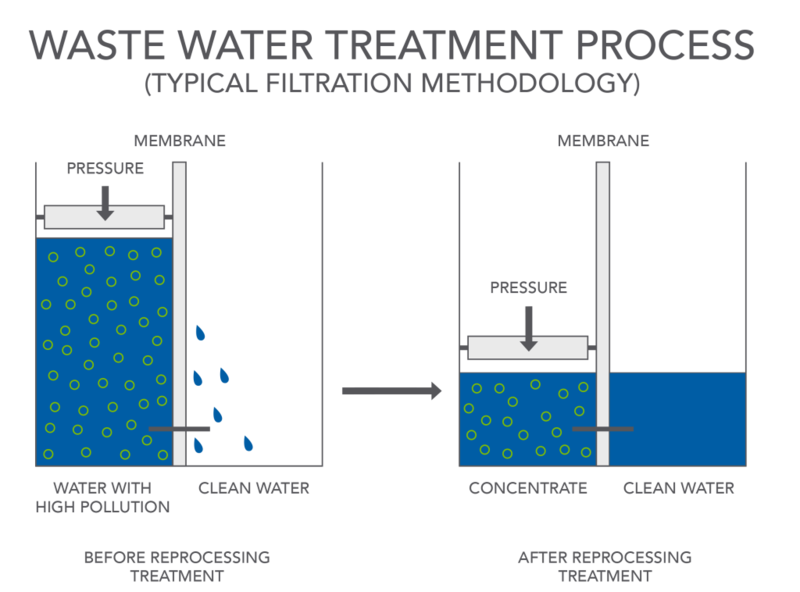 Often combinations of procedures are necessary to obtain optimal results in treating process water. In ultrafiltration, as in microfiltration, basically macro-molecules and small particles as well as suspensions or emulsions are separated. The boundaries between the two processes are not sharp: Membranes in the area of a few µm to 0.1 µm are designated as microfiltration, membranes in the pore area of 0.1 – 0.01 µm are designated as ultrafiltration. The operating pressures are in the area from 0.5 to 20 bars in ultrafiltration. The separation effect in ultrafiltration results for the most part from a sieving effect, i.e., the particles that are retained are the particles that are larger than the average diameter of the membrane pores. In addition, solubility and diffusion effects also play a role. The decisive technical innovation is in the coating and construction of the filter membranes. As a result, so-called “fouling”, the clogging of the filter membranes was reduced by up to 50%. As a result of reduced “fouling”, CRS is able to achieve higher feed rates and more stable product quality. Reverse osmosis is among the procedures driven by pressure. Reverse osmosis (RO) is used for separation of salts or ions from principally hydrous solutions. RO is used for the increased concentration of solutions as well as for the separation of aqueous components. For this process, a semi-permeable membrane is used. It has the characteristic that the aqueous components pass through the membrane, while most of the ionic components are retained to a high extent. As a result of the (same) charge, however, the dissolved ions are retained. This means that, for polar substances such as water or other polar solutions, lower retention or higher flow-through is attained, while larger charged ions are retained for the most part. 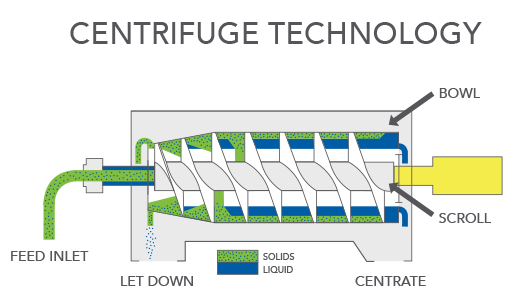 The idea underlying a centrifuge is based on the processes in a settling tank. There, particles, sediments and solid substances slowly sink to the bottom and fluids of varying densities separate due to the effect of gravity. This separation process, however, proceeds very slowly and does not accord with the demands of the industry for a fast process with controlled results. The separation results depend on the sedimentation speed and the surface that can be used for the separation. Decanter centrifuges normally use horizontal separation and work somewhat slower. Thanks to diverse construction, length and cylindrical geometry, decanter centrifuges can always be used when two- or three-phase separation of solid substances and liquids is necessary. 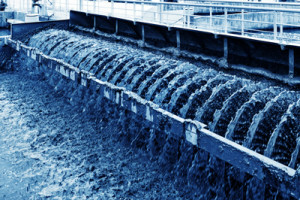 An important area of application is the dehydration of sludge in sewage treatment plants. Separators with high rotation speeds remove diverse solids continuously from one or two liquids. High speed separators are principally used for the separation of fluids. Due to the centrifugal force in the separator, fluids/particles collect with high density on the wall of the drum. Both fluids are then removed via different outlets. Distillation is a thermal separation procedure to separate fluids based on boiling point differences. Distillation has the advantage compared with the other separation procedures that no additional substances such as adsorbents or solvents are needed. In distillation, first the starting mixture is brought to a boil. The resulting vapor, composed of low boiling point components of the solution to be separated, is then liquefied again by cooling in a condenser. Finally, the liquid condensate is collected. Typical applications of distillation are the distillation of alcohol, the distillation (rectification) of petroleum in the refinery, or the production of distilled water. The “simple distillation” described above, by heating and cooling, is based on the vaporization and condensation of volatile substances. These, however, are not separated, or are only incompletely separated. One can collect at most individual “fractions” with differing boiling temperatures. These procedures depend on the differing boiling points of the fluids involved, more precisely on their differing vapor pressure at the same temperature. This is explained with respect to a mixture of two fluid components mixable with one another (“binary mixture“). We support our customers as a reliable partner during the entire operating life of their facilities. We respond to the needs of our customers by offering excellent quality, and innovative technologies. We assist with process development in our Research and Development group located in Lewisberry, PA.